It’s no secret that a good image is what will catch the viewers attention first. And of that image, the text is really what will jump out at them (second to the eye-catching photo used). We all want our posts, our crafts, our items for sale or whatever to be well received by others, and most importantly, stand out from the crowd. Crafters have you seen our new category here on TheHungryJPEG? We have specially selected fonts that we know would work great for showing off your latest masterpiece. Before we get into the suggestions of really neat and crafty fonts, let’s go over a few key things to keep in mind regarding fonts and making the best choices. Font families were designed to work well together. Try searching out for a Font Family that offers both a Serif, and Sans Serif style within it. Sticking to one family of fonts overall not only helps you cut the clutter, but it also will help ensure that the fonts will play nicely together in any combination. This is a big one, please don’t over do it when choosing to combine fonts. In fact aim to have no more than 3 fonts at max that you’d want to use. A basic rule of thumb, choose a Sans-serif, a Serif and a Script font that works well together. It’s easy to get carried away and want to use way too many fonts. Alternatively, it’s also easy to use the selected fonts totally wrong. For example, using a really decorative script font completely throughout a piece, or using a font like that in all caps – begins to be way too much. Mixing or pairing two fonts similar in style will often appear “blah!”. Try combining a bold thick slab font with a thin or light sans-serif font. When a font combination lacks contrast, it makes it not only harder to read, but also visually uninteresting. One key thing to also remember is the style of you’re trying to portray. Are you a vintage inspired crafter? Are you more on the modern side? 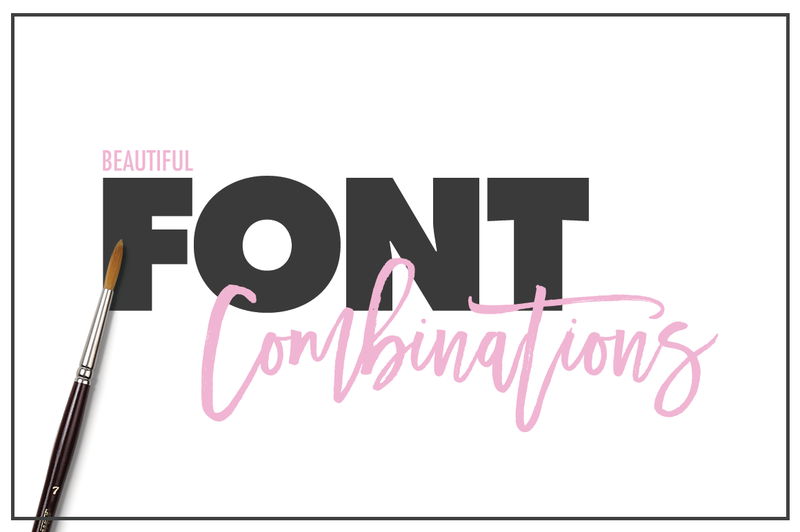 Consider you’re overall style, or the vibe you’re wanting to send with each piece, and that can also help you choose your appropriate fonts (remember no more than 3 fonts). Let’s pretend we’re trying to show off some sort of knitted item, or something related to the art of knitting. Here are a few images with font combos that could work. Here we’ve paired the readily available sans-serif Lato font with a more rough and crafty font Madina Script. Together they allow the viewer to be visually interested in wanting to know more. Here we introduced another font into the combination above, and we tried to use a font that wouldn’t add conflict, but instead compliment the mix. New font Abril FatFace helps draw the eye in to the title area and plays very nicely with the script font. This is a truly playful combo, yet everything remains legible and offers great contrast. In use is Caferus, Cardo and Lato fonts. Stand out with a really big, playful and fun script that’s still completely legible. Melaney Lane font is so great paired up with the bold Montserrat font. High contrast yet it still keeps things interesting. All completely free fonts. Perfect for use if you have some sketches in your notepad that’d you’ve love to share with the world. FFF Tusj provides the perfect hand drawn and sketched in look, and Mathilde is a great compliment, as it appears to also be a handwritten script. Together with Arapey they make a great combo. Geo Sans light is a free font that works really well for adding text that packs a punch in a thin size. Paired up with V Agnes Duo and Valentines Agnes (which are two fonts in the same family, so they were made to play nicely with each other). Amigirl is such a lovely font. It’s one of our featured Crafters Fonts. Within the font family, you have a beautiful script paired up with a Sans Swash. You can even add a basic font like Open Sans to compliment the pack. The Cherryla Scrip is a playful script font that has quite a few glyphs. It pairs up really nicely with Source Sans Pro font, a really robust free sans-serif font. Looking for a pen script font that’s bold, fun and beautiful? Aprillia Script is just that. And it goes so well with the clean, crispness of the Articulat CF sans. Love this post! All your pairings are aesthetically pleasing, but I really like the Source Sans Pro + Cherryla combo. Madina Script is awesome as well. I recently added a few fonts from Creative Market to my arsenal, with Sickamore being my favorite. Really helpful! Thank you very much! I was wondering if you had an idea of which fonts to use for a lawyer’s website? I was thinking of something more serious but who knows, maybe you have something better of an idea. Actually, I was looking for font pairings for Articulat CF and found this page. I had found a lot more other interesting combinations of fonts. I liked it. The overall design and the way you conveyed the information was very elegant. The font examples were good. I will try some of them. But first I need to learn to install the font and run it myself on the website. Let me know if you have page for installing new fonts on wordpress. Secondly, I found some of the Google fonts do not have the depth of colour and crispness of some of the other fonts (which are to be purchased). Why is that ? I am using Merriweather for the body font. It somehow lacks the crispness of the ‘Guardian’ font used in Harvard Business Review. Please let me know why is this ? Thank you. I enjoyed reading through your post.